SC Trakiec relaxation centre is available for your adequate relaxation. 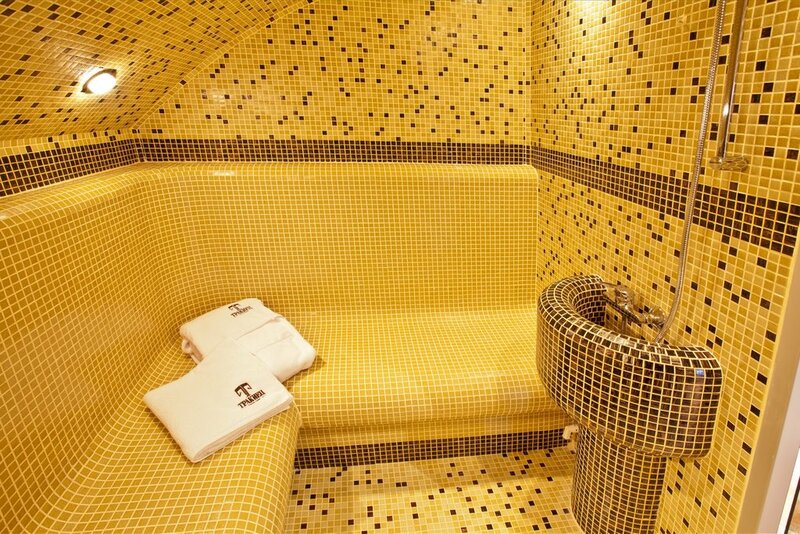 You may take advantage of rehabilitation procedures – Jacuzzi, steam bath, sauna and massages in its cozy environment. The unforgettable experience, special attitude and lots of positive emotions are guaranteed. Relax zone works with reservation made in advance at the reception. Steam bath 60 minutes BGN 8. 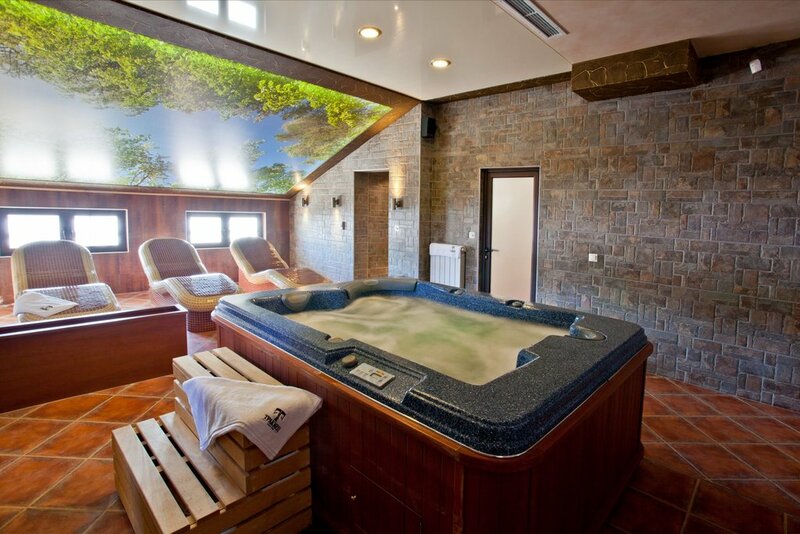 Jacuzzi – Hydro massage is a massage based on the therapeutic effect of water. Provides complete relaxation, relaxes muscles, helps to increase mental and physical activity, fights successfully with stress. Under water jet massage is the so called jacuzzi. The procedure is immersion in the bath in which water has a high temperature, but can be adjusted. Under the water spout powerful jets. Steam bath is an ideal way to cleanse your body from harmful substances through a heated steam spray under pressure and also has anti-inflammatory, hydrating and analgesic action. Steam bath radiates heat of about 45°C with air humidity close to 100%, which in turn creates ideal regeneration conditions. Flavoured system creates further positive emotions by spraying pine, lavender or mint aroma in the air, while quiet and soft music creates an extra sense of comfort and relaxation. Sauna –Sauna positive effects are indisputable. It has been proven that regular use of sauna enhances immunity and may prevent people who have initial symptoms of a cold or flu from getting sick. Another effect of sauna is detoxification (cleansing the body of toxins that adversely affect the whole body), which stimulates the release of toxins accumulated in the body, by accelerating human body chemical processes. It has been proven that some of sauna positive effects are due to the fact that water sprays on extremely heated rocks lead to the formation of lots of negative ions in the air, which improve breathing, increase oxygen content in blood, stimulate cardiovascular system, eliminate headaches and stress and improve the ability to concentrate. Another interesting fact about the sauna is that sauna heat assists the body in getting rid of lactic acid which is formed during training and therefore is recommended to use sauna after a short rest after trainings. Classic full body massage with grape seed oil and extract against dry skin and for strengthening the skin tissues. Anti-cellulite massage with special anti-cellulite oil. Partial massage with natural essential oil (back, neck, shoulders and head). Massage for children, with cocoa oil, at their request. Therapeutic deep (powerful) full body massage with Thracian mixture, offered exclusively at Trakiec equestrian center, for improving the blood circulation and enhancing the oxygen circulation in the body. A relaxing ritual for rehabilitation and soothing after foresee riding, performed with natural essential. Neck, shoulders and head massage, plexotherapy with natural essential oil. Light therapeutic full body massage with natural essential oils of choice (mint, rose, eucalyptus, lemon) with soothing, antiseptic and antibacterial effect. Therapeutic full body massage with pure bee honey and magnesium extract for stress relief, normalizing the nerves and muscles function and toxin absorption. The foot and palm massage is based on the theory that specific parts of the legs are connected to other parts of the body, including the internal organs. This type of massage uses the thumbs and fingers. Reiki is a system for action by laying hands on the human body. By putting your hands on the so-called chakras create an opportunity for a larger flow of vital energy. It acts simultaneously at all levels: the physical, etheric, astral and mental body and restores the relationship with the visual mind. It restores the person psychologically, emotionally, mentally and spiritually. Reaching energy is positive and can not cause harm. Energy relieves pain, relaxes and calms. Traditional Hawaiian massage that uses a combination of massage techniques, nut oils, and sometimes elements of prayer and breathing to restore energy and soothe the body. This massage helps to explain its principles – the massage works gently but deeply into the muscles with continuous, flowing strokes, allowing the recipient to relax and give in to the nurturing touch.